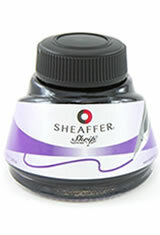 Buy the Sheaffer Skrip Bottled Ink(50ml) Fountain Pen Ink for less. Pen Chalet is an authorized Sheaffer dealer and all of our products including the Skrip Bottled Ink(50ml) by Sheaffer are guaranteed to be new and authentic. The Sheaffer Skrip Bottled Ink(50ml) Fountain Pen Ink usually ships within 1 business day unless otherwise specified. Each Sheaffer Skrip Bottled Ink(50ml) Fountain Pen Ink we sell is guaranteed to be genuine, authentic and will arrive brand new & unused! Tried and tested ink. Not as vibrant as I'd like in a purple ink but very good none-the-less. I went through a lot of issues trying to get the shipment outside the US and Ron was there all the while sorting out the problems and I'm grateful for his support (in spite of my many emails and calls to him with loads of probably impertinent questions and difficulties I was having). I wanted a super red ink and I finally found it. Sheaffer Skrip red is a bright no-nonsense type of ink. It delivers a beautiful red color. I was truly pleasantly surprised at the quality of Sheaffer ink as I had not owned any ink by that brand before. If you are looking for a red to take notes, for grading, or even just everyday writing, I recommend the Skrip red. I currently have it inked in my TWSBI 580 with a medium nib and the pairing is a success. Thank you Pen Chalet for the excellent service.